Infiniti soon will begin manufacturing in a fifth country -- Mexico -- compared with three each for Lexus and Acura. 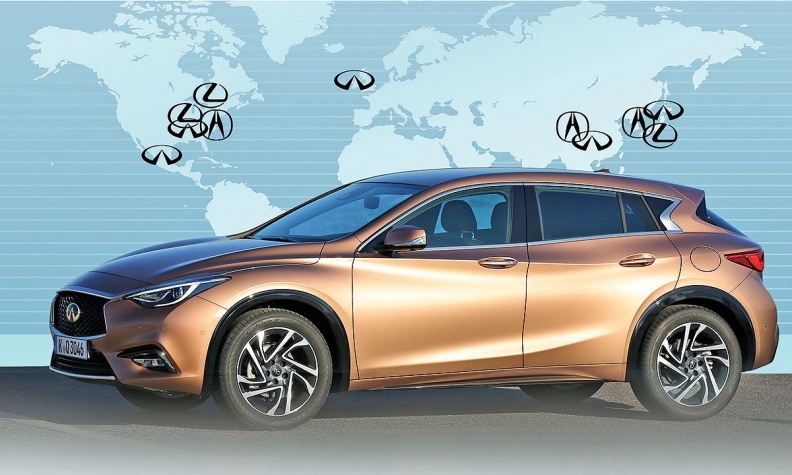 Infiniti is building the QX30 crossover in England primarily to serve customers in Europe and the United States. YOKOHAMA, Japan -- To premium player Infiniti, the key to cracking the top tier of luxury brands is simple: To be truly global, you need to build vehicles globally. Infiniti, which already makes cars in the UK, China, Japan and the U.S, will take that strategy a step further this year when it opens a plant in Mexico, marking the brand's fifth country for production. The strategy is accepted wisdom around the industry -- but not always in the premium segment. Infiniti has gone beyond even its two more established Japanese rivals, Lexus and Acura. The multination strategy is all the more brazen for Infiniti because it is one of the industry's smallest premium brands. Small carmakers typically try to leverage scale by bunching output in as few locales as possible. Lexus, for instance, sold 652,000 vehicles worldwide in 2015 and manufactures in just three countries: Japan, the U.S. and Canada. Acura, which sold 182,414 vehicles last year, builds its cars in Japan and the U.S. It will start making a new compact crossover in China this year. Infiniti sold 215,250 vehicles globally last year. The Mexico plant, a $1 billion 50-50 joint venture with partner Daimler, will go online in the fiscal year ending March 31, 2017. "You always need to have a global footprint to be a global player," Infiniti President Roland Krueger said June 22 on the sidelines of the annual shareholders meeting for the brand's parent company, Nissan. Spreading production benefits Infiniti several ways, Krueger said. For starters, it provides a natural hedge against currency swings. Japan's vacillating yen can easily lop profits off vehicles exported from Japan. Making vehicles closer to their buyers alleviates some of that risk. It also helps Infiniti get new products to market faster. And in some cases, such as in Mexico, it allows Infiniti to tap a lower-cost manufacturing base. Setting up factories in multiple countries is a pricey strategy for a small producer, however. The 50-50 partnership with Daimler will help shoulder the cost. 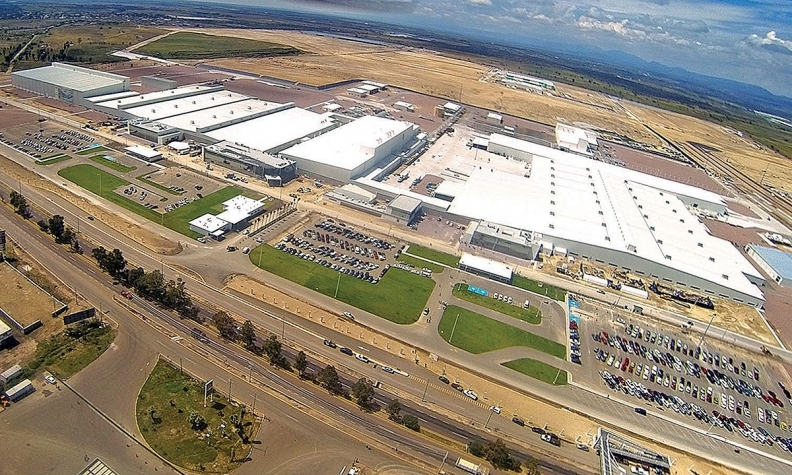 The plant in Aguascalientes, Mexico, will produce luxury models for Infiniti and Mercedes-Benz brands. It will have annual capacity of 230,000 vehicles, but the companies have not said how they will divvy the output. Although Infiniti hasn't announced what vehicle it will make there, the 2017 model year brings several new products. On the way are a redesigned Q60 coupe, the new British-built QX30 crossover and a family of new engines for the Q50 and Q60. The U.S. also will get a freshened seven-passenger QX60 crossover. Going big and global has been critical for Infiniti. With the addition of the new factory in Aguascalientes, Mexico, Infiniti will produce vehicles in five countries, rare for a small automaker. When Nissan CEO Carlos Ghosn unveiled his Power 88 business plan in June 2011, he said Infiniti should achieve a 10 percent global market share with world sales of around 500,000 in the fiscal year ending March 31, 2017. But even before Krueger took the helm at Infiniti last year, brand executives already were rolling back Ghosn's timeline for reaching those goals. Infiniti determined it would need a broader production base to come close. 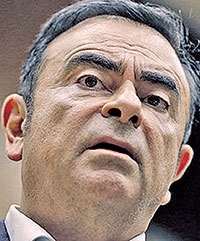 At the shareholders meeting, Ghosn said 2016 would be an important year for the brand thanks to the addition of more production firepower in Mexico. "With this level of capacity," Ghosn said of the Mexico plant, "Infiniti is poised to make significant performance gains. With stronger products and enhanced production, we expect to see further growth for Infiniti." Infiniti has not given a sales target for 2016, but global sales rose 16 percent in 2015. Having a diverse production base has another important payoff on the retail side, Krueger said. Investment in new plants builds dealer trust and morale. "If the dealers are committing to the brand, they see that we are committing to the region," Krueger said. "In the long run, that will make a big difference." That dovetails with Krueger's goal of improving the retail experience. There too, he wants to globalize things. 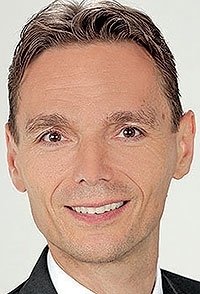 Krueger cites the brand's Infiniti Client Acquisition and Retention Experience database, known internally as ICAR, as a practice that will spread globally. Launched in the U.S. in July 2015, the system consolidates customer information in a unified database across different parts of the business, from service to sales to financing. It allows for more seamless interaction with customers and gets rid of such showroom headaches as having to fill out multiple registration forms. It makes dealer interactions faster and easier. ICAR has been adopted by 99 percent of the dealer body in the U.S., and about 83 of all retail sales are delivered through that platform, Nissan says. The automaker now wants to introduce it globally, starting in Canada and Mexico. Its internal metrics indicate it has been a hit with customers, Infiniti spokesman Stefan Weinmann says. Meanwhile, there is one key global market where Infiniti still isn't present: Japan. That may change. The company has said in the past that it is considering an entry into Japan. Krueger says his team is studying a Japan launch "very seriously" but adds that there is still no decision.